The objective of this pilot study is to describe the efficacy and safety of an initiation algorithm for 4 mg of warfarin in ambulatory patients with atrial fibrillation. The regimen for induction of 4 mg of warfarin proposed by Siguret and colleagues was followed.9 All patients received a 4-mg dose of warfarin at 6:00 pm for 3 days, with the first day of warfarin treatment designated as day 1. An INR measured in the morning on day 4 was used to determine the dose of warfarin (Table 1) to be taken until the next scheduled INR test. The predicted weekly maintenance dose was determined by multiplying this dose by 7. Pharmacists who were experienced with anticoagulation dosing adjusted subsequent warfarin doses as necessary based on INR measurements, typically obtained biweekly (more than 48 hours apart) following day 4. This was continued until patients reached their actual maintenance doses (Figure 2). All INR measurements were completed using a point-of-care electronic device. Our primary outcome measure was the number of INR values that were greater than or equal to 4.0 before the warfarin maintenance dose was reached. We chose this as our primary end point because INR values greater than 4.0 have been associated with a substantial risk of major bleeding events.12 Secondary outcomes included bleeding events that required medical attention, symptomatic thromboembolic events, the number of days required to reach a therapeutic INR (INR greater than 2.0 after at least 5 days of therapy), and the correlation between the nomogram-predicted maintenance dose based on the day 4 INR and the actual warfarin maintenance dose (Pearson correlation, r2). 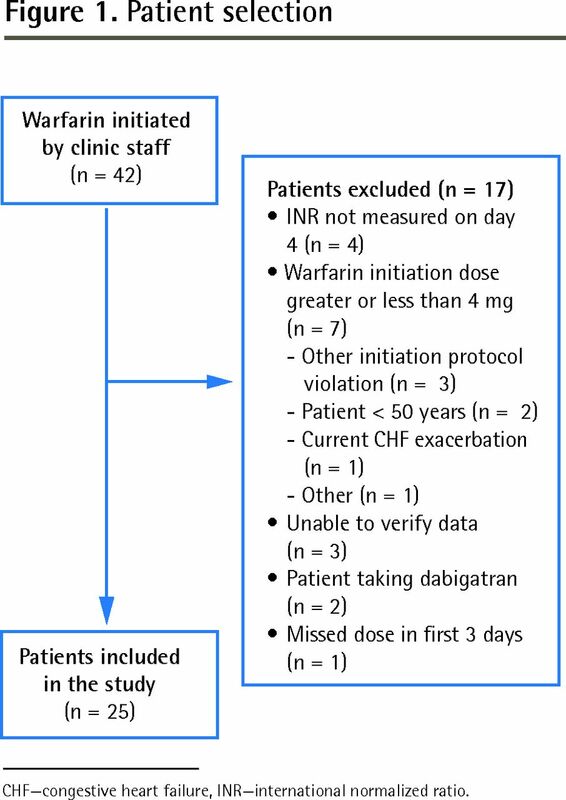 The warfarin maintenance dose was considered to have been achieved when 2 consecutive therapeutic INRs were obtained at least 48 hours apart in the absence of clinically meaningful warfarin dose changes. 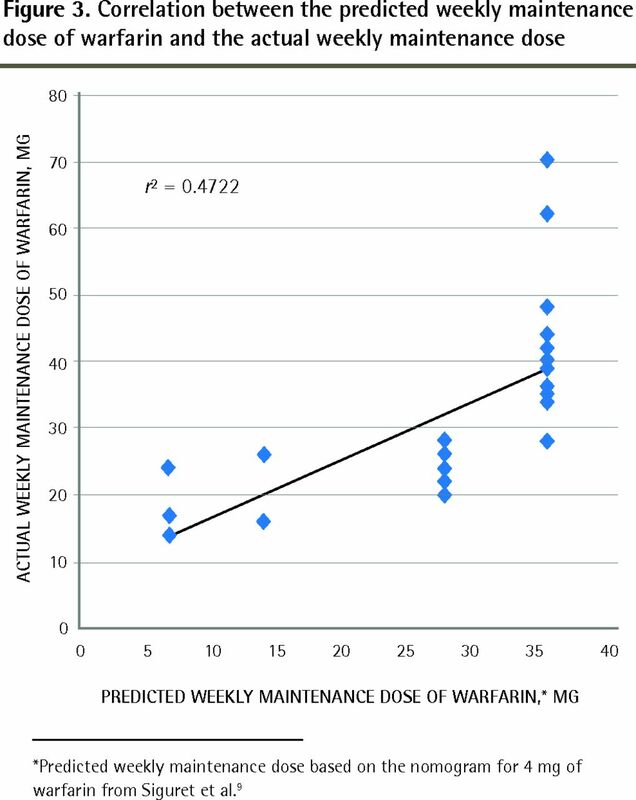 The warfarin maintenance dose was expressed as a weekly dose of warfarin (in mg) by adding the daily doses starting 4 days before the first therapeutic INR was obtained (Figure 2). A change of at least 10% in the weekly dose was considered a clinically meaningful dose change. Twenty-five of 42 patients met the inclusion criteria. Reasons for exclusion are described in Figure 1. The average age of the patients was 76.0 years. The average CHADS2 (congestive heart failure, hypertension, age ≥ 75 years, diabetes mellitus, and stroke or transient ischemic attack) score was 2.0, and 44.0% of patients reported using acetaminophen regularly. Additional patient demographic characteristics are listed in Table 2. Only 1 patient had an INR of greater than 4.0 during the study period (INR = 4.1). This patient also experienced superficial bleeding on the shins that did not require medical attention. Of note, this patient was also taking prednisone. There were no other INR values greater than 4.0. When considering secondary outcome measures, there were no episodes of bleeding requiring medical attention, nor were there any thromboembolic events. An average of 11.0 days (95% CI 8.3 to 13.6) was needed for patients to reach a therapeutic INR. The average predicted and actual weekly maintenance doses were 26.9 mg (95% CI 22.8 to 31.0) and 31.9 mg (95% CI 26.5 to 37.2), respectively. The predicted and actual doses correlated modestly (r2 = 0.47; Figure 3).9 The difference between predicted and actual daily doses was within 1 mg in 17 patients (68.0%), and the predicted dose was equal to the actual dose in 3 patients (12.0%). Three patients were found to have deviated from the study protocol either by missing warfarin doses or failing to comply with scheduled INR test dates. A separate analysis of patients who did not deviate from the warfarin dose and test date recommendations did not identify important differences. The objective of our study was to evaluate the use of a simple warfarin initiation protocol for outpatients with atrial fibrillation. There were 3 main findings. First, the nomogram used was associated with a low risk of excessive anticoagulation. There were no major bleeding episodes or thromboembolic events. Only 1 patient had an INR greater than 4.0, with concurrent prednisone use as a possible contributor. There are important limitations to this study. First, despite the low incidence of bleeding and thromboembolic events in the study population, our sample of 25 patients was not large enough to adequately assess these end points. Second, while we found that the day 4 INR could account for 47.2% of the variability in warfarin dose requirements, the derivation and validation study by Siguret and colleagues using the same nomogram reported that the day 4 INR accounted for 84%.9 This might relate to differences in the patients studied (patients in our study were younger), the setting (warfarin dose administration was supervised and INRs were measured more frequently in the hospital setting), or a combination of these factors. Nonetheless, our study is more reflective of the challenges experienced in an ambulatory practice. This pilot study demonstrates the utility of a simple warfarin initiation protocol for ambulatory patients with atrial fibrillation. Future studies will aim to enrol more patients in hopes of demonstrating a reduction in bleeding and thromboembolic complications using this algorithm. In this pilot study, the initiation protocol of 4 mg of warfarin was associated with a low risk of excessive anticoagulation. There were no major bleeding episodes or thromboembolic events. A therapeutic international normalized ratio (INR) was achieved in 11.0 days on average, which is consistent with another outpatient protocol, but slightly longer than warfarin induction regimens for inpatients. Eleven days seems acceptable, as rapid achievement of a therapeutic INR is unnecessary for patients with stable, chronic atrial fibrillation. The nomogram used in this study was helpful in predicting the maintenance dose of warfarin. The day 4 INR explained nearly half of the variability in the maintenance dose. Dans cette étude pilote, l’utilisation d’une dose initiale de 4 mg de warfarine était associée à un faible risque d’anticoagulation excessive. Il n’y a pas eu d’épisode de saignement majeur ni d’accident thromboembolique. En moyenne, le rapport normalisé international (RNI) thérapeutique a été atteint en 11 jours, ce qui concorde avec un autre protocole pour des patients externes, mais est légèrement plus long que les régimes d’introduction de la warfarine chez des patients hospitalisés. Ces 11 jours semblent acceptables puisqu’il n’est pas nécessaire d’atteindre un RNI thérapeutique plus rapidement chez un patient présentant une fibrillation auriculaire chronique stable. Le nomogramme utilisé dans cette étude était utile pour prévoir la dose de maintien de la warfarine. Le RNI du jour 4 expliquait près de la moitié de la variabilité de la dose de maintien. All authors made substantial contributions to the design of the study, and to the analysis and interpretation of the data. Dr Srinivasan Sridhar and Dr Leung drafted the article. Ms Seymour and Dr Nagge revised the manuscript for important intellectual content. Dr Nagge was responsible for the study concept.
. Epidemiology, etiology and mechanism of atrial fibrillation [article in French]. Bull Acad Natl Med 2011;195(4–5):953-60.
. Antithrombotic therapy for atrial fibrillation: antithrombotic therapy and prevention of thrombosis, 9th ed: American College of Chest Physicians evidence-based clinical practice guidelines. Chest 2012;141(2 Suppl):e531S-75S.
. Dabigatran association with higher risk of acute coronary events: meta-analysis of noninferiority randomized controlled trials. Arch Intern Med 2012;172(5):397-402. Epub 2012 Jan 9.
. Moving toward a more ideal anticoagulant: the oral direct thrombin and factor Xa inhibitors. Chest 2013;143(4):1106-16.
. Rates of hemorrhage during warfarin therapy for atrial fibrillation. CMAJ 2013;185(2):E121-7. Epub 2012 Nov 26.
. A warfarin induction regimen for out-patient anticoagulation in patients with atrial fibrillation. Br J Haematol 1998;101(3):450-4.
. Flexible induction dose regimen for warfarin and prediction of maintenance dose. Br Med J (Clin Res Ed) 1984;288(6426):1268-70.
. A comparison of a low-dose warfarin induction regimen with the modified Fennerty regimen in elderly inpatients. Age Ageing 2000;29(1):31-4.
. Initiation of warfarin therapy in elderly medical inpatients: a safe and accurate regimen. Am J Med 2005;118(2):137-42.
. Warfarin use among ambulatory patients with nonvalvular atrial fibrillation: the Anticoagulation and Risk Factors in Atrial Fibrillation (ATRIA) study. Ann Intern Med 1999;131(12):927-34.
. Dabigatran: review of pharmacology and management of bleeding complications of this novel oral anticoagulant. J Med Toxicol 2011;7(4):281-7.
. Optimal oral anticoagulant therapy in patients with mechanical heart valves. N Engl J Med 1995;333(1):11-7.
. Oral anticoagulant therapy: antithrombotic therapy and prevention of thrombosis, 9th ed: American College of Chest Physicians evidence-based clinical practice guidelines. Chest 2012;141(2 Suppl):e44S-88S.
. Prediction of warfarin dose: why, when and how? Pharmacogenomics 2012;13(4):429-40.